Having a man cave-like garage you can be proud of is something all car guys dream about. Although we've detailed the ten steps to building one, here's ten commenter-chosen addition to make your dream garage become a reality. Why You Need It: For those cold winter nights when you've almost got that last bolt un-siezed and you're this close to getting the old part out, keep your feet warm with radiant tile. Heck, why stop in the garage? Get the whole house done while you're at it! Why You Need It: Need some weird, obscure part for your Tatra restoration, but don't want to wait for Vlad to wake up in St. Petersburg? No problem! With your own CNC rig, you can whip up a new suspension linkage in no time. It takes 'do-it-yourself' to a whole new level. Why You Need It: Van Sarockin suggests a lift of the hydraulic nature, but really whether it's hydraulic or electric, having a lift in your garage is a luxury that truly makes it perfect. It's often the one thing everyone wishes they had in the garage, but few get to the point of actually installing one. Why You Need It: Need a tool from across the room? Forget to bring the part you needed under the car with you? No problem! With a live-in shop assistant, you can stay working under the car and send your assistant off to grab parts, turn up the stereo, and bandage your hand. Also, they're good for delivering pizza. Why You Need It: Snapoversteer says: "There's something about a garage that makes it perfectly acceptable to drink a beer at 11:00 a.m." For as long as mankind has toiled away in the garage, there has been beer there to help the process along. And that beer needs to stay cold, yet close at hand. The garage fridge is the perfect solution. Why You Need It: It's important to be ready for anything that might roll through your door. With every Haynes & Chilton manual ever printed, you can tackle almost any hellish project with confidence. Also, if your workspace is in need of decoration, get a couple of pages of diagrams blown up & hang them on the walls. Why You Need It: Check your project's power as you work, without interrupting the flow of progress! Don't worry about putting your half-finished build on a trailer and carting it off to your local shop when you can just push it across the floor to your very own private test rig. Host dyno nights for your friends too, once your project is all set to be shown off to the world. Why You Need It: For when you absolutely need to scribble something down, but don't want to stop to find a pen and paper, these walls are covered in paint that replicates a dry erase board. Diagram out your whole build, get shopping lists together, and draw on the wall the whole time! It's all erasable, so when you're done with that list, get a new one going in its place! Why You Need It: After a long day carving up country roads or on-track, you're tired. You don't want to have to either stop off at the car wash on the way home, or do it yourself once you get there. In your dream garage though, you won't have to! A touchless wash installed somewhere would let you keep your rides pristine after every drive. 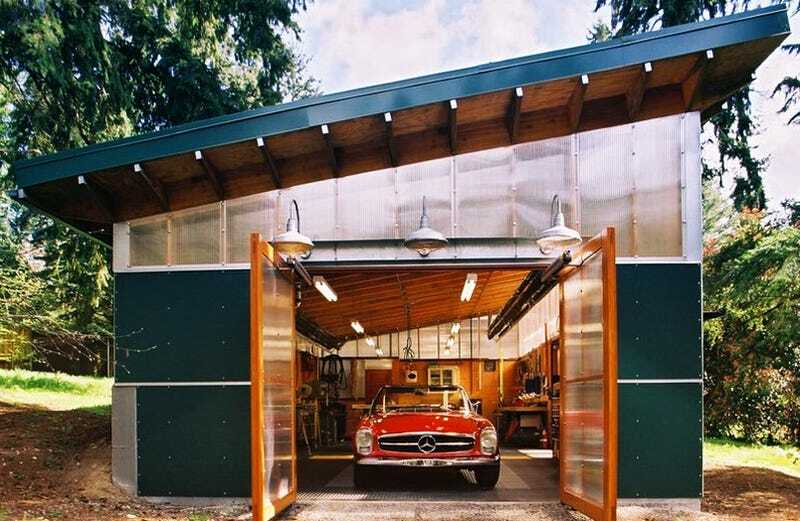 Why You Need It: If you've got grand plans for your garage mahal, then they probably include more than just a work space. The garage probably becomes more of a chill cave, somewhere to kick back either before, after or during a long repair session. Nice lighting, comfy chairs, and a view of the cars are all part of the deal. Just like that guy in California with the Boxer.